Spring is here and so are things with wings! 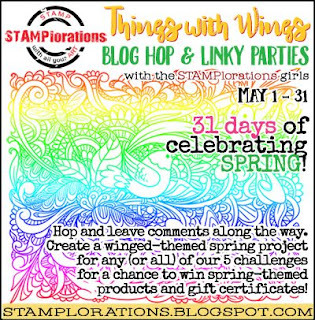 And STAMPlorations is celebrating with a super fun blog hop and lots of prizes to be won! Check out the details by clicking here. 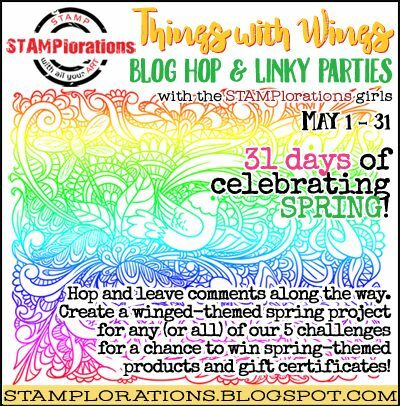 Join the CUTplorations Winged-Theme challenge for a chance to win a $15 gift certificate or one of five random $5 gift certificates! For my card, I white embossed images from the Winged Things stamp set and watercolored over the embossed images. I then watercolored a circle and stamped the butterfly. To finish, I added the Thinking of You CUTplorations Phrase die! I love the vibrant colors and fun layout on your beautiful card! So sweet. Love the colours. This is one of my favorite cards from the DT this month! The color washes and butterfly image go together so beautifully.